including Ipe, Massaranduba, and Garapa. Sucupira (also known as Brazilian Chestnut or Tiete Chestnut) grows in the heart of Brazil to towering heights of 130 feet with trunks two to three feet in diameter. It is harvested from responsibly managed forests in order to ensure the longevity of this renewable resource. Sucupira wood is chocolate brown when freshly cut, becoming dark brown after kiln drying. Light brown narrow stripes give a fibrous aspect to the wood similar to the grain of palm. Heartwood colors range from tan to dark brown with intermittent lighter stripes. The sapwood ranges from off-white to cream. Sucupira’s Janka rating is 2140 lbf. This makes it much harder than oak or pine, and similar to that of Jatoba wood. It’s naturally resistant to fungi, termites and water, making it an exceptionally durable choice. Natural finisher works best to enhance and preserve the original color. 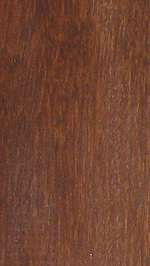 Exposure to light has little effect on Sucupira making it one of the more color stable species of hardwood. Sucupira wood, although beautiful in color and naturally resistant to decay, is prone to stability problems. For maximum stability, we recommend face screwing as opposed to hidden fasteners. This method is fast and secure, but does leave exposed screw tops, which many people find unattractive. Hidden fasteners offer an unblemished surface, but require a longer installation process and leave the decking free to expand and contact with weather, which can cause an uneven surface. If you prefer hidden fasteners, we recommend the Pro-Plug system from Starborne. For a groove and clip system, consider the Ipe Clip Extreme with a high quality subfloor adhesive on the joists. If you have any questions regarding best practices for Sucupira decking installation, our knowledgeable staff would be happy to assist you.